The city whose lights are in the movie’s title is ur-metropolis, a hybrid of Paris, New York, London, and Tangiers that in its sum total of urban follies might be known more concisely as “Los Angeles” — or the city of the imagination that, on a vast backlot in the 1920s, anyway, went by that name. Laid even lower by the Depression, Charlie Chaplin’s little tramp conspires to give a blind flower girl back her sight and also to give the movies back their hush after they irrevocably had entered the era of sound. 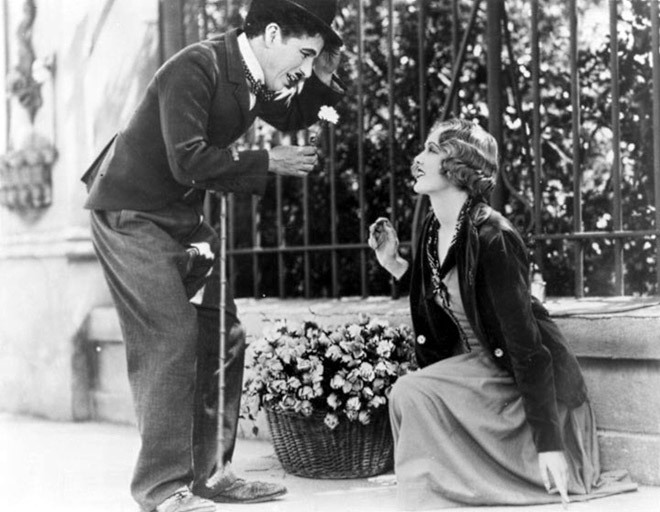 Over four years production was interrupted by personal drama, money woes, and the profound psychological shift of a country tumbling from prosperous self-confidence to existential panic, but at the box office City Lights redeemed Chaplin’s faith in it even as the movie failed to turn back the hands of time or technology. With one of the two most shattering endings in movies (see Essential Movie Library #4), which is nothing more complicated than a closeup of the actor-director’s face frozen in its mix of love, humiliation, and a hope that he himself barely believes in, this is the masterpiece of the modern age’s first superstar. Over the decades the collective opinion of critics, academics, and hipsters has come to favor the less sentimental, more modern genius of Buster Keaton, but the ever enduring heart of Chaplin—yearning and defiant in the face of advancing melancholy—beats on, with disparate directors from Orson Welles to Federico Fellini to Stanley Kubrick to Andrei Tarkovsky to Woody Allen expressing their awe, unable to break free of its spell. Though Chaplin didn’t have D. W. Griffith’s ambition or scope or Keaton’s inherent grasp of cinema’s possibilities, he remains the colossus of his era anyway, the keeper of its silence even after he already was surrounded by noise.